It’s National Pollinator Week, and a transmission right-of-way near North Carolina’s Electric Cooperatives’ Hamlet power plant continues to bloom as part of the NC Wildlife Federation’s “Butterfly Highway” program. A one-acre plot of pollinator-friendly plants native to the state is in its second year of growth during a three-year assessment period. The project delivers a vegetation management solution that meets both our reliability compliance and environmental stewardship goals. The U.S. 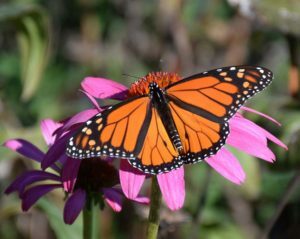 Fish & Wildlife Service is currently encouraging public support of monarch butterfly habitats, including through rights-of-way plantings. The agency is reviewing the butterfly’s status for possible inclusion on the endangered species list in 2019. Learn more about our pollinator pit stop via Carolina Country magazine. Additional information about other co-op efforts to support pollinators is also available at electric.coop.